Before reading this blog, can you answer these below questions? What are you going to do in the next 10 years? After answer those questions, can you think of the answers of these questions? Have you tell anyone about your dream? Did people think that you're not gonna make your dream comes true? Did people say, "Naaaa, you ain't gonna make it.. Keep dreaming!" If you answered the questions already, let's take a look at this. I know some of your dreams are might be out of reach (if you answered it honestly). Some of you might wanna be a President, an international soccer player, a successful businessman, a singer, an actor, or even a billionaire. Most of you also might think that you're just gonna keep it in your mind because you don't think that it's gonna happen. Probably only 1 out of 100 people in the world would think it is gonna happen in anytime in your life. Is it right? Dream, is a very strong word. Dream, is not a thing that only stay in your head when you sleep. Dream, is not a wish. Dream is a HOPE, hope is something that you will reach. Dream is something that you BELIEVE that is going to happen in your life. You might heard about miracle. Miracle wouldn't be a miracle if it wasn't exist before. When you have a dream, and you don't believe it, then it is NOT going to happen. It is so a simple logic of thinking. The another strong word is Believe in your dream. Like what i wrote before, people would say that you are not gonna make it. That is because people do not believe in your dream! Does what people think matters to you? Do people make your future? No! It's YOU that make your own future, not what people think of you. For some of you that told people about your 'unachievable' dream, you probably heard people said that you are an Arrogant person. It is not arrogant! It's what we called confidence. Confidence means you trust yourself, you believe yourself. It gives you strength and make you believe that you will reach what you wanna reach. If you don't have confidence, means you don't believe in yourself, and it also means you don't believe people that close with you are going to help you to make your dream comes true. Remember, It's not only you, you have people around you, your friends, relatives, family, that will try hard to make you reach your dream. Some of you might found some excuses (read my previous blog ; What makes us different). Some of you would think you couldn't make your dream comes true because you are not capable to make it, because you don't have enough luck to get a talent as good as anyone else. People! There is no such a thing called luck! Luck is word created by people who regret their incapability. Luck created by an thing called effort. Effort is something you created by working hard. Talent is not a luck. It is an incredible gift from God which all people were given since they were born no matter how small it is. So what do you suggest? are you keep finding your excuses or try to find your way to make your dream and 'luck' come after you? 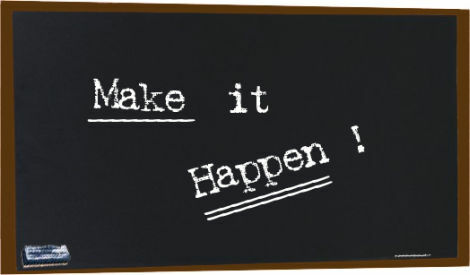 Make it Happen, is the most important thing to reach your dream, to believe your dream, to believe in yourself. Dream and believe is important elements. But if you don't make it happen, you dream will only stuck in your head. it is not going to happen. So what's the point of dreaming and believing? Yes, you have to make it happen! You have to be optimist! Believe yourself! Believe you dream! Believe you are gonna make it! Forget about what people said about your dream! Forget about you 'unreachable' thought! Start to make your dream comes true! Life does not come twice. If you keep waiting for a second chance, then it means you failed. People failed because they think they failed. Keep dreaming, keep believing, then Make sure that you have to make it happen!